WSJ Home page with ad, originally uploaded by LanceWiggs. Horror upon horrors – my $151 annual subscription could not save me from a half page advertisement on WSJ.com. 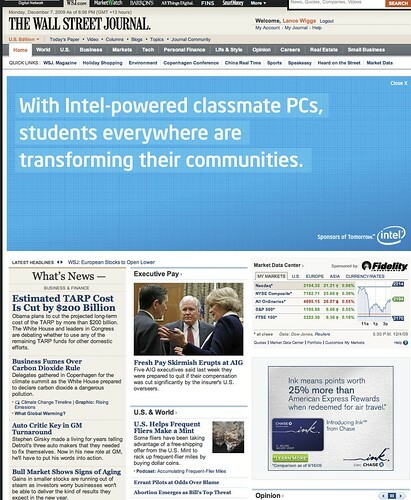 I do find it amusing that Intel finds it necessary to spend this much to tell the world that they are helping schools. In today’s social media driven world the smarter thing to do may have been to allocate that money to the schools they are trying to help, and ask them to tweet and facebook out the message.